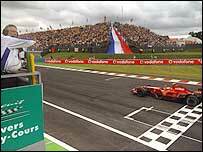 F1 boss Bernie Ecclestone is reportedly considering keeping the French Grand Prix at Magny-Cours for 2008. Ecclestone has agreed to include the venue for next year, and possibly for 2009, after a meeting with French prime minister Francois Fillon. "The venue will be kept for 2009 if there are no solutions for an alternative," said Ecclestone. He had previously stated that the 2007 race at Magny-Cours would be the last French Grand Prix at the circuit. "Mr Ecclestone said he agreed in principle with keeping the French Grand Prix at the Magny-Cours circuit," said a statement from Fillon's office. Ecclestone is keen to see the event moved away from the remote track, which replaced the Paul Ricard circuit as host for the French Grand Prix in 1991. He has stated that he would prefer a venue closer to Paris. French Grand Prix organisers have expressed their determination to keep hold of the race until the contract with Eccelstone expires in 2011. The French Federation (FFSA) said in a statement: "The FFSA Executive Committee has decided to implement a search for sites with a view to durably ensuring the future of the French Grand Prix."